Versatility and a clearly structured range of products: that’s what Lettura® recycled paper is all about. Subdivided into five product groups - printing paper, office paper, envelope paper, exclusive vat paper and special paper - Lettura® caters reliably to the needs of printers, graphic designers and other users. Lettura® is the only 100% recycled paper in the entire world available in all five brightnesses - from 60 ISO to 72, 80, 90 and even 100 ISO. With the naked eye, it is now virtually impossible to distinguish our premium range from wood-free paper. With its natural appearance, and quality on a par with expensive near-natural image paper, the Lettura® range offers great scope for creativity. Thanks to its finish, Lettura® paper is also perfect for producing first-rate results in printing. 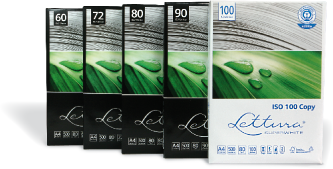 Lettura® paper is available in a range of grammages, from 50gsm to 110gsm. In response to customer requests, Lettura® is now also available in both rolls and sheets.